Sarajevo is a city that wears its history for all to see as evidenced by many walls still pockmarked with hundreds of bullet holes. The ravages of war were brutal, but this incredibly diverse community found ways to come together to rebuild Sarajevo to the amazing city it is today. 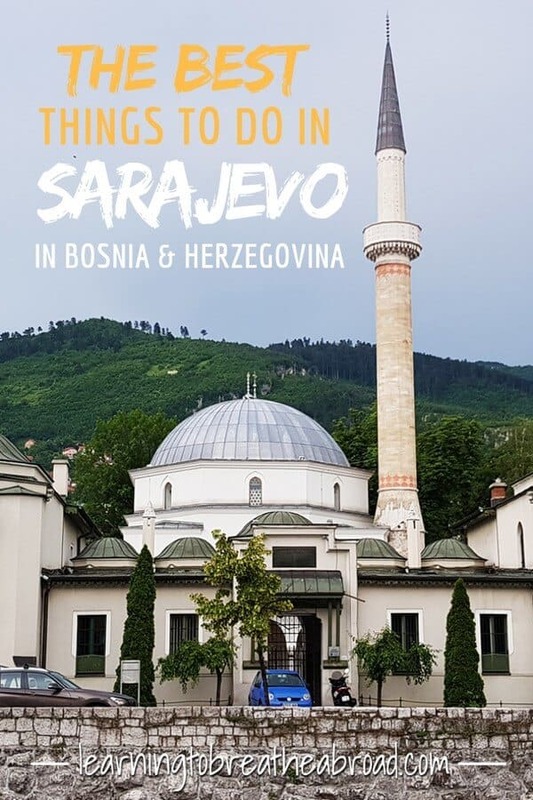 Famous for its cultural and religious diversity you’ll find temples, mosques and churches all side by side, leading some to call Sarajevo the “Jerusalem of Europe”. Sarajevo’s architecture will delight you as it takes you from the Austro-Hungarian period to the Ottoman Empire and back again. 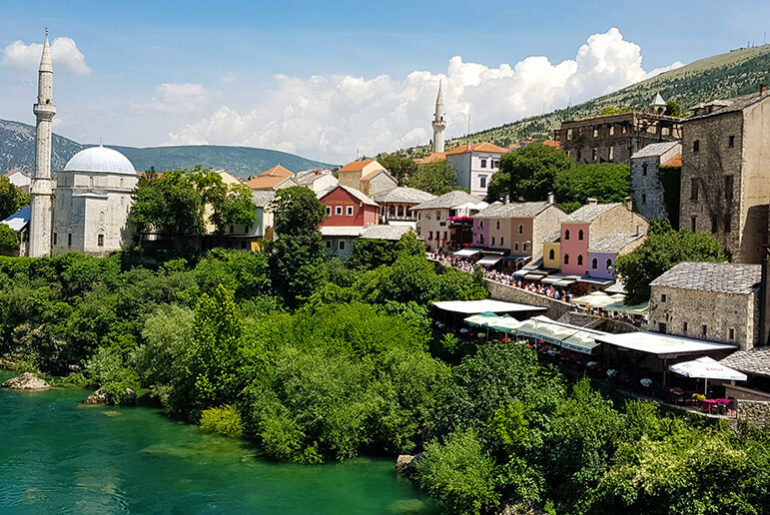 Wander the pedestrianised streets of the old town Baščaršija, stroll along the banks of the Miljaca River and enjoy the myriad of other best things to do in Sarajevo. Join us as we take on a trip from Mostar to the delights of Sarajevo and on to the town of Visegrad. At the heart of Mostar is the Old Ottoman bazaar. Narrow cobbled alleyways, bustling tourists and eager shopkeepers. Here you’ll find everything from War War 2 regalia, Turkish carpets, and hookah pipes to tacky souvenirs. Watch the crazy divers plunge from the famous Stari Most Arch bridge into the icy waters below, wander the quaint old streets and eat delicious food at the riverside restaurants. 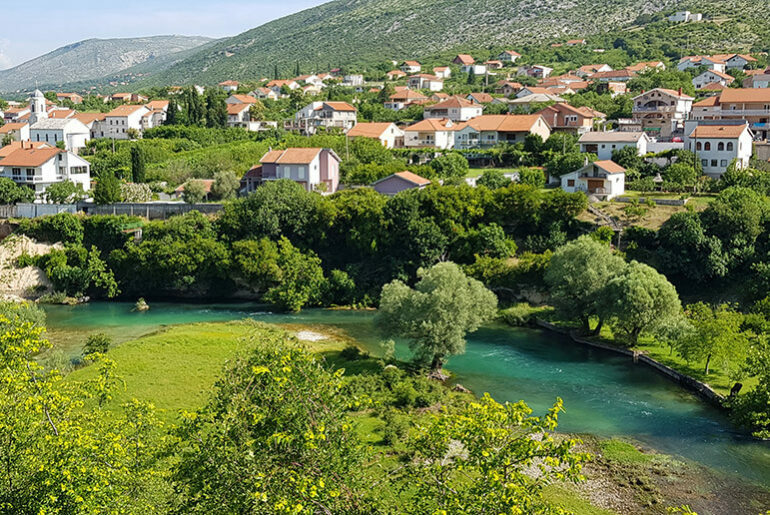 The first part of the drive from Mostar to Sarajevo followed the Neretva River until we reached the magnificent Lake Jablanica. A huge body of aquamarine water so beautiful that we had to stop to enjoy it for a bit. Shortly thereafter, the road started following the Tesanica River as it meandered through a deep gorge. This is where things gots scary! There were numerous tunnels to travel through, none of which had any lights and they were dark, I mean pitch black dark. The white line had all but disappeared and there were no reflectors anywhere so there was nothing to follow through the inkiness. My headlights barely made a difference and some of the tunnels were up to 1km long. To say that it was terrifying is to put it mildly. After this trip, I can safely say that I HATE TUNNELS!! The speed limit was 60km in most places, which suited us fine, but despite their being police at every turn trying to catch speeding drivers, the locals kept up a steady stream of flying past us with death-defying passing techniques. When I say there were police at every turn, I really mean it! Tai and I reckoned that at least 50% of the population would have to be policemen as they were EVERYWHERE! When you drive a campervan, finding parking is not always that easy, so I always diligently research parking options before we arrive. Due to immigration stamping my incorrect visa, we only had 3 days in Bosnia, so I didn’t bother getting a SIM card. This meant I had to rely on the Google map I had downloaded offline to guide us. I also couldn’t access my trusty Park4Night or Camper Contact apps to search for places to park and stay overnight, so we arrived in Sarajevo wholly unprepared. On arriving in Sarajevo, we hit a series of one-way streets and narrow roads and to top it off it was 5pm and rush hour traffic. I finally located a huge parking lot but the guard rudely waved me away saying that campervans were not allowed. It had been a stressful drive, I was trying to manoeuvre Miles McFlattery in lots of traffic and my nerves were becoming more and more frayed. Eventually, we found a supermarket with a teeny parking place open. I am still not sure how, but I managed to manoeuvre Miles in with a huge sigh of relief. We were 3.5km from the old town, so grabbed the bikes and headed off to see what Sarajevo had in store for us. Sarajevo is a complex mix of sparkling new, dilapidated old and beautifully restored historic buildings. The traffic was a bit mad and cycling was a bit touch and go, but we made it to the centre of town and found a place to lock the bikes outside the amazing Old Library building. We rode past some buildings still riddled with bullet holes made at the time of the dissolution of Yugoslavia. A sober reminder of the war that devastated Sarajevo in the 1990’s. Running through the length of Sarajevo is the Miljaca River with the famous Latin Bridge. This was the site of the assassination of Archduke Franz Ferdinand of Austria by Gavrilo Princip in 1914, which became the catalyst for World War I, so an incredibly imortant landmark in our time. We made our way to Bascarsija Square where the famous wooden Sebilj Fountain can be found right in the centre. The square was teeming with pigeons which we stopped to feed. Tai has a huge love of pigeons and feeding them is one of his favourite things to do. Leading off from the square is a network of alleyways that intertwine through the length and breadth of the Old Ottoman Bazaar. The old town is pedestrianised so we wandered the streets and the narrow alleyways of the old Ottoman bazaar, looking at various trinkets for sale. The aroma of spices and strong coffee permeated the air as we browsed the stalls. There was all manner of souvenirs made from rifle shell casings, alongside pens, magnets and delicious Turkish Delight. We passed the majestic Sacred Heart Cathedral (Roman Catholic), the Orthodox Church (Serbian) and the Jewish Museum. There was a prayer session in progress at the 16th-century Gazi Husrev-Beg Mosque, so we watched and listened to the melodious chanting for a while, then found a restaurant for something to eat. The local currency is the Bosnian Mark, but due to our whirlwind visit, I hadn’t wanted to draw cash in the local currency. We had been in Bosnia and Herzegovina for 3 days already and had managed to get by using only our Euros, so once again we tried our luck, this time in Sarajevo. So far so good, until Tai wanted a doner kebab at a small stand. They wouldn’t accept Euros, but ever helpful he said: “No worries, the restaurant across the way will take Euros so go there”. So we did. The next morning, my heart was in my mouth as the locals clearly were not happy about our parking spot and had tried to park us in. To this day, I still have no idea how I managed to get us out of the tight spot we were in! It probably took about 20 minutes of backward and forwards to finally inch our way out but we did it. Once again we had overcome the odds and were on our way!! It was early and we had to be out of Bosnia by the end of the day, so we headed East to the town of Visegrad and yes, more tunnels!! The town of Visegrad is the site of the famous Mehmed Paša Sokolovic Bridge, a UNESCO world heritage site which was popularized by the poet, Ivo Andric in his novel, The Bridge on the Drina. 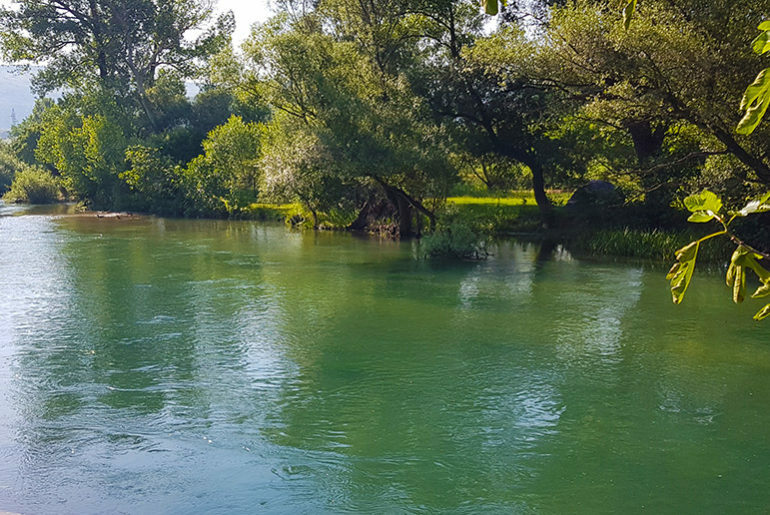 This beautiful arched, Ottoman-era bridge spans the emerald coloured Drina River and naturally, Tai had to J-board the length and breadth of it. Somehow I manage to convince the parking lot attendant to accept Euros and the same with the restaurant where we ate lunch, although we had to do the transaction all cloak and dagger-like in the back of the restaurant. Apparently, there are inspectors that check and they can get into a lot of trouble accepting Euros. Following the canyon of the Rzava River, on our way to the Serbian border, we stopped at the Dobrun Monastery, also known as Kruševo. This site is of great importance to the Serbs, as it is where Karadorde (Dorde Petrovic) hid immediately before launching the first Serbian uprising in 1804 which ultimately led to the abolition of Serbian serfdom. The monastery lies on the opposite side of the river, accessible only via the brightly painted red bridge. A few kilometres later we reached the border between Bosnia and Herzegovina and Serbia. A fairly quick wave through on the Bosnian side and with my heart in my mouth we approached, the Serbian border. Please stamp our UK Visa, please stamp our UK Visa. I jumped out of the car with all our documents, opened my passport to the UK visa and asked him to let us in on our UK visas. “No problem!” he said and we were in!! !